George Howard Branson, sales manager and farmer, was born in Perth on 23 February 1918, the third of five surviving children of South Australian-born Howard Henry Branson and Ethel May, née Carrett, from Victoria. At the turn of the century Howard had been a goldminer in Geraldton and went on to acquire interests from mining magnate Claude de Bernales. Faced with lung problems, Branson left the mining industry and by 1928 the family had settled on a wheat and dairy farm known as Hampton Court, at Babakin, 235 kilometres east of Perth, where George spent his early years. He attended Babakin primary school and played piano, drums, accordion, saxophone and trumpet in a small local orchestra. Leaving the farm in 1937, he worked as a salesman of agricultural and household products and as a stock agent in nearby Bruce Rock, and sold cars in Kalgoorlie. George was ‘a great reader’ like his father, but the two held opposing political views. George claimed that his own conservative opinions were developed in reaction to his father’s strong support for the ALP. On 31 December 1940 Branson married Isla May Burlinson, a schoolteacher, at the Methodist church in the Perth suburb of Nedlands. He had just joined the AIF. Over the next nine months Branson received four promotions, becoming a lieutenant in August 1941 in the 2/4th Machine Gun Battalion. During his training at the Medium Machine Gun School, he was described as a ‘definite and forceful personality, inclined to be over-bearing, tending to tactlessness’, who with more self-discipline, ‘should prove to be a useful and energetic leader’. Branson embarked for overseas on 15 January 1942, seeing action in Singapore where the 2/4th suffered heavy casualties. When the colony fell on 15 February 1942 he became a POW of the Japanese, including at Changi and on the Malayan mainland before being moved to work on the Burma–Thailand railway, after which he was sent back to Singapore. At some period, along with other Australian officers, Branson was segregated from the ranks in an area outside the camp at Changi. Later he recounted how several of these officers formed a political discussion group that included several future Australian parliamentarians including Kenneth Anderson. As part of the group, Branson co-authored a paper emphasising the importance of land settlement and rehabilitation programs for POWs returning to Australia. In April 1942, while working to build a road, Branson organised a camp concert by thirty or so musicians who had made the instruments on which they played. On 5 September 1945 Branson was recovered from Changi and was repatriated to Australia in October. Following a period in hospital and in the Lady Mitchell Convalescent Home, and a spell at military headquarters in Perth, he was released from the army on 22 November 1946. Contrary to most, he always maintained that General Gordon Bennett, who had escaped controversially, when Singapore fell in February 1942, had acted honourably and correctly. In 1947 George and Isla purchased a property at Babakin that they named Grassmere. Branson joined the new Liberal and Country League (LCL) of Western Australia, working to establish local branches and divisions, as well as becoming a member of the RSL and the Farmers’ Union. In 1955 he moved to Perth, probably on the advice of Senator Paltridge that he should stand for the Senate at the December federal election. In the LCL Senate preselection contest Branson defeated the long-serving Senator Agnes Robertson who, at 73, was thought by Prime Minister Menzies to be too old. Undaunted, Robertson crossed over to become a candidate for the Country Party, and defeated Branson at the poll. In 1957 Branson became president of the Stirling division of the LCL, and in 1958 a member of the party’s state executive. Branson tried again for the Senate, and was successful at the federal election of 22 November 1958 when he filled the casual vacancy (previously filled by Senator Drake-Brockman), created after the death of Harrie Seward. Branson took up his own periodic vacancy from 1 July 1959. Branson’s contributions to the Senate relied heavily on statistics, but were thoughtful and well-researched. His first speech on 17 February 1959 was a ‘catch-all’, drawing attention to Western Australia’s gold, wool and sheep, its fishing and tourism industries, and its potential for oil development. He waxed enthusiastically over the state’s ‘magnificent jarrah and karri forests’. In later speeches, he supported Britain’s right to join the European Common Market and, denying the view of ‘cynics and critics’ that the Senate did not function as a States House, he cited occasions where senators from Tasmania and South Australia had overcome party differences to ensure that votes were taken to protect the interests of individual states. Unusually for a member of a major party, he praised the role of proportional representation in ensuring the parliamentary presence of small parties and independents. He spoke regularly on repatriation issues and urged the Government to be lenient to those ex-servicemen who had been discharged from the army without a medical examination, and who later sought compensation for war-related medical conditions. For four years Branson repeatedly raised the issue of lack of television coverage in country areas of Western Australia and urged the introduction of translator stations to transmit programs to those regions. His efforts were finally rewarded when the Government amended the Broadcasting and Television Act 1942 in 1963 to enable the use of translators. Branson regarded this as his most significant legislative achievement. Some of his actions belied his natural conservatism. In February 1970 he said: ‘From what I know to date … there is a case to be made out for legalising marihuana’. As chairman of the Senate Select Committee on Air Pollution, he criticised proposed measures for compulsory control of car fumes as inadequate. In October 1966, debating proposed amendments to electoral laws relating to the filling of Senate casual vacancies, Branson crossed the floor, joining the Democratic Labor Party’s Senator Gair and Senator McManus in claiming that the legislation breached the principles of proportional representation. Branson was a member of several Liberal–Country Party backbench policy committees, such as those on food and agriculture, mining, atomic energy and national development. 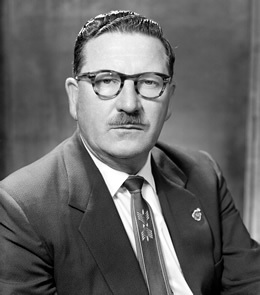 He also served on committees on foreign affairs and immigration, and for a short time in April 1971 was Government Whip during the absence overseas of Senator Withers. Branson claimed to have established an anti-communist committee along with William Wentworth, MHR. Branson was also a member (and at sometime president) of the Asian Peoples’ Anti-Communist League. During a debate on defence in the Senate on 13 November 1964, he made the extraordinary allegation that in 1942 two Labor members of the War Cabinet had asked their military advisers how Australia could make a separate peace with Japan. Goaded by Senator Hendrickson and Senator Dittmer to name the two ministers, Branson identified them as H. V. Evatt (then incapacitated) and Eddie Ward (who had died the previous year). Declining to reveal the source of this information, Branson was taken to task not only by the Leader of the Opposition in the Senate, Senator McKenna, but also privately by his colleague and mentor, Senator Paltridge, Minister for Defence and Leader of the Government in the Senate. He was forced to withdraw the accusation unreservedly. The Melbourne Age suggested that he should resign, its editorial commenting that ‘Senator Branson’s premeditated slanders will stand on the record as a blot on the standards of behavior of the national Parliament’, while the Sydney Morning Herald, heading its editorial ‘Branson’s Folly’, referred to ‘the unconcealed scorn’ of Branson’s colleagues. The episode does not appear to have done Branson any lasting harm. He continued to be an active backbencher, especially as a member of Senate committees. He was alert to possible encroachments against the rights of Parliament by the executive or the media. During Question Time on 26 September 1967, Branson voted with the Opposition on a motion of dissent from a ruling by the President of the Senate, Sir Alister McMullin that a minister had the right to ask that further questions be placed on the Notice Paper without proposing a motion. The dissent motion was successful. The following month he resigned from the Joint Committee on the Australian Capital Territory, arguing that his membership served no useful purpose while the committee was reliant on ministerial direction as to what matters it investigated. In May 1971 the Senate Committee of Privileges reported that the Sunday Australian and the Sunday Review had each published details of the report of the Select Committee on Drug Trafficking and Drug Abuse in Australia, prior to its presentation to the Senate, constituting a breach of privilege. In the chamber Branson, a member of both committees, moved that the Privileges Committee inquire into how the newspapers had obtained the report. When the Leader of the Government in the Senate, Sir Kenneth Anderson, proposed successfully that debate on the motion be adjourned to ‘the next day of sitting’, Branson commented that ‘if the Senate does not want to inquire into what is happening it is just too bad’. The next day he resigned from the Privileges Committee. On 18 May, in a quaint two-minute ceremony in front of packed public and press galleries, the two offending journalists were called to the bar of the Senate and severely reprimanded by the President before being asked to withdraw. ‘Thrashed with a feather’ remarked Senator Gair. In July 1968 Branson was part of an unsuccessful attempt by a group of Liberal backbenchers to unseat the long-serving President McMullin. Branson, who by his own account, ‘would have loved to have been President of the Senate’ was mooted as a strong contender. From September to December 1968 he was one of two parliamentary advisers to the 23rd session of the General Assembly of the United Nations. With his term due to end on 1 July 1971, Branson decided not to contest the Senate election of 21 November 1970. He stayed on in Canberra, spending some time as a consultant for the Canberra office of the prominent public relations firm, Eric White Associates. In December 1971 the Minister for the Interior, Ralph Hunt, announced that Branson had been appointed chairman of an advisory council to investigate the organisation and regulation of taxi services in the ACT. This caused the Canberra Times to speculate on the wisdom of appointing Branson so soon after his departure from federal politics. On 10 November 1973, following a divorce six days earlier, Branson married Berlin-born Hannelore (Hanni) Erna Zimmermann, the couple living in the Canberra suburb of Pearce. His life continued to have moments of drama. In 1976, together with former Liberal minister Victor Garland, he was charged with breaching the Electoral Act by offering an independent ACT Senate candidate ‘valuable consideration’ in return for supporting the Liberal Senate candidate John Knight. In the Canberra Court of Petty Sessions the charges were dismissed. In 1989 George and Hanni moved to Wanneroo in Western Australia. Branson died on 27 January 1999 and was cremated at Karrakatta Cemetery. Hanni survived him, as did the four sons of his first marriage. Senate Opposition Leader Lionel Murphy had complimented Branson on his input into the Select Committee on Drug Trafficking and Drug Abuse, and his contribution to fair debate, ‘sometimes quite strongly—sometimes a little over strong’, adding ‘he desires to understand his fellow man and fellow woman. He wants to help them. He has great sympathy, which has transformed his own life and has been a very great quality to inject into this chamber’. George Howard Branson, Transcript of oral history interview with Clarrie Hermes, 1984, POHP, TRC 4900/16, NLA, pp. 1:2, 1:5, 1:7, 1:9–11, 1:17–18, 1:20, 1:30–1, 1:35–6, 2:2, 2:7–13; The editor acknowledges the assistance of Michael Nind and Frank de Cinque, Department of Industry and Resources, WA; Branson, George Howard—Defence Service Record, B883, WX10372, NAA; Murray Ewen, Colour Patch: The Men of the 2/4th Australian Machine Gun Battalion 1940–1945, Hesperian Press, Victoria Park, WA, 2003, p. 239; AWM, Prisoners of War (Malaya), viewed 13 Mar. 2009, <http://www.awm.gov.au/awm232/>; James Boyle, Railroad to Burma, Allen & Unwin, North Sydney, 1990, p. 33. Branson, Transcript, pp. 2:22–3, 2:28–9; WA (Perth), 7 Feb. 1955, p. 1; Age (Melb. ), 29 Nov. 1955, p. 3; Liberal Party, WA branch, Report of state council, 1957, Minutes of 8th annual conference, Perth, 1958, MS 5000, box 349, folder 62/77, part 1, NLA; WA (Perth), 24 Nov. 1958, p. 15. CPD, 17 Feb. 1959, pp. 18–21, 27 Feb. 1962, pp. 149–57, 28 Mar. 1968, pp. 432–5, 14 Sept. 1961, pp. 571–3, 2 June 1960, pp. 1277–8, 15 Oct. 1963, p. 1102, 29 Oct. 1963, pp. 1566–8; Branson, Transcript, pp. 6:3, 9:24. SMH, 20 Feb. 1970, p. 5; Age (Melb. ), 16 July 1969, p. 12; CPP, 91/1969, 91A/1969; CT, 27 Oct. 1966, p. 4; CPD, 19 Oct. 1966, pp. 1204–5, 26 Oct. 1966, pp. 1464–6; Senate, Journals, 26 Oct. 1966, pp. 627–8. Today (Perth), June 1964, p. 1; Branson, Transcript, p. 7:1; CPD, 22 Apr. 1971, p. 995, 28 Feb. 1967, p. 168, 13 Nov. 1964, pp. 1774–86; CT, 14 Nov. 1964, pp. 1, 3; CPD, 16 Nov. 1964, p. 1787, 17 Nov. 1964, p. 1861; Age (Melb. ), 17 Nov. 1964, p. 2; SMH, 18 Nov. 1964, p. 2. Senate, Journals, 26 Sept. 1967, pp. 217–18; CPD, 26 Sept. 1967, pp. 889–90, 17 Oct. 1967, pp. 131–2, 18 Oct. 1967, p. 1371; CPP, 163/1971; Sunday Australian (Syd. ), 2 May 1971, p. 1; Sunday Review (Syd. ), 2 May 1971, p. 845; CPD, 13 May 1971, pp. 1864–5; Australian (Syd. ), 15 May 1971, p. 5; CPD, 14 May 1971, p. 1935; SMH, 16 July 1968, p. 7; Branson, Transcript, p. 10:16; CPP, 184/1969. CT, 1 Dec. 1971, p. 1, 11 Dec. 1971, p. 7, 13 Dec. 1971, p. 2, 21 Dec. 1971, p. 12, 6 Mar. 1976, p. 3, 9 Mar. 1976, p. 1; Sunday Times (Perth), 21 Feb. 1999, p. 44; CPD, 12 May 1971, pp. 1712–13. This biography was first published in The Biographical Dictionary of the Australian Senate, vol. 3, 1962-1983, University of New South Wales Press Ltd, Sydney, 2010, pp. 496-500.